The DI 5.5LCR pairs a pivoting 1" aluminum tweeter with two 5-1/4" drivers for precise highs, full-bodied bass, and impressive dynamic range. The pivoting tweeter allows you to aim the sound directly toward your listening area, so you can fine-tune your system's sound. 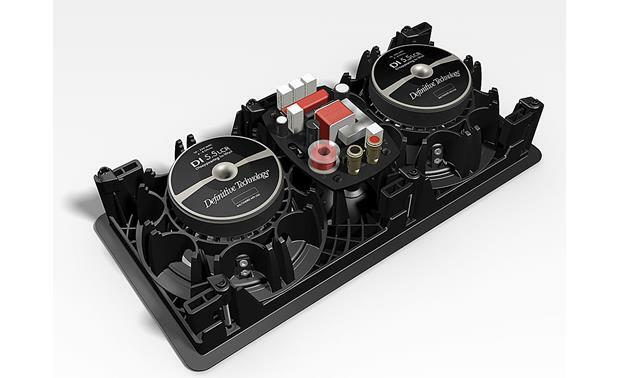 You can use the DI 5.5LCR in a home theater system, or as part of a multi-room music system. It's voice-matched with Definitive Technology's Mythos and Bipolar speaker lines, so you can mix and match. An optional Definitive Technology Di 5.5LCR rough-in bracket is recommended for installing this speaker in new construction (brackets sold in pairs). 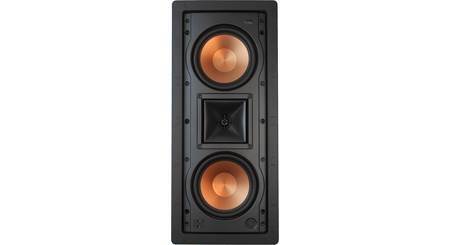 cutout dimensions: 6-7/16" x 14-3/8"
Product sounds amazing with BP9060 towers. Build quality is excellent, as to be expected from Definitive Technology. 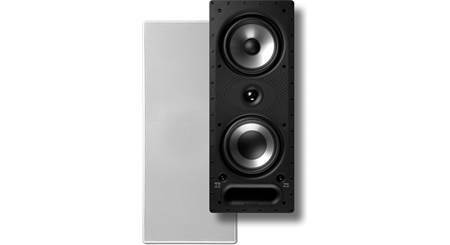 Overview: The Definitive Technology Disappearing In-Wall loudspeaker (DI Series) offers high-quality sound from a speaker that is barely visible when installed in a wall or ceiling. The Definitive DI Series incorporates BDSS drivers, a pivoting tweeter, and integrated flanges behind an unobtrusive grille to provide audiophile-grade sound quality with an almost invisible appearance. Disappearing In-Wall Design: The DI 5.5LCR features Definitive Technology's Disappearing In-Wall Design. The mounting flange thickness of the in-wall loudspeaker is no more than 2.5mm (0.099") and is completely covered by the grille that stands a mere 3.5mm (approx 0.145") from the wall surface. The grille is "micro-perf", that while presenting an opaque appearance, actually has more open area than typical perforated metal grilles allowing the sound to pass through with less interference and better fidelity. Behind the metal grille is an acoustically transparent proprietary cloth scrim that effectively blacks the dark "shadow" of the black speaker parts from showing through the grille. Pivoting Aluminum Dome Tweeter with Waveguide: The DI Series in-wall loudspeaker uses Definitive Technology's proprietary ceramic-coated annealed aluminum 1" dome tweeter. The DI 5.5LCR tweeter is post mounted, and the tweeter housing is specially smoothed and shaped to use it as an extremely effective low-diffraction waveguide. The aluminum dome tweeter features a pivoting design which allows you to focus the sound toward or away from your listening area depending on the application. BDSS Drivers: The DI 5.5LCR uses two 5.25" BDSS drivers for wide-bandwidth accurate frequency response, broad dispersion, low distortion, and maximum detail retrieval. Each 5.25" BDSS driver cone is supported by specially tuned soft rubber surrounds at both the outer and inner edges. 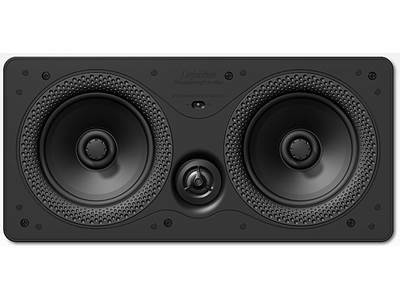 The double surrounds allow the cone to have longer excursion without distortion. As bass output is a function of both a cone's diameter and excursion, the higher excursion BDSS system brings the benefit of higher bass output from smaller drivers. The DI 5.5LCR's dual 5.25" BDSS drivers have the bass output and dynamic range of a typical 8.0" driver. Linkwitz-Riley Crossover Network: The Definitive Technology DI 5.5LCR's second order (12dB/octave) Linkwitz-Riley crossover offers a smooth frequency and phase transition from driver to tweeter for natural midrange response and excellent off-axis performance. A Zobel network flattens the impedance curve of the speaker making it easier for today's digital amplifiers to drive the speakers. Custom tight-tolerance (+/- 5%) components are used throughout the crossover for superb unit-to-unit performance consistency. Superior metal film capacitors are used in the high-pass section and the Zobel network for extended high frequency response. Oversize inductors (coils) avoid saturation thereby maintaining the wide dynamic range capabilities of the driver. AeroRing: The dimpled AeroRings around the 5.25" drivers are soft Sanoprene rubber and serves several important functions. First, it damps the basket/flange assembly nearest its thinnest part (the flange) to prevent resonance. 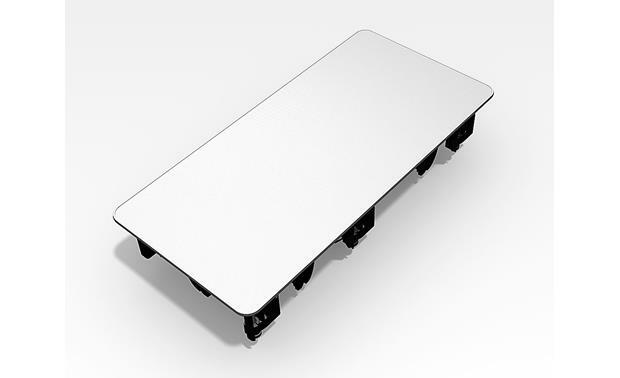 Second it prevents the grille from rattling in the unlikely event that it makes contact with the speaker frame. It also provides a smooth transition for the waveform coming off the cone. Similar to the dimples on a golf ball that reduce turbulence to aid in longer flight, the dimples on the AeroRing promote smooth "laminar" air flow over the surface thereby reducing diffraction effects. The DI Series in-wall loudspeakers sound clear, natural, and disperse their sound over a wide area. PolyStone Basket: The driver basket, mounting flange, and mounting system of the DI 5.5LCR is one piece of cast PolyStone; Definitive's exclusive formulation of polymers and minerals that combine the rigidity and strength of metal with the resonance damping properties of plastics. As a result of the one-piece mounting system, the DI 5.5LCR offers increased strength, a compact size, and maximized cone area. Besides being more space efficient than multi-piece construction, it also contributes to the superior sound quality of the DI Series speakers. Connections: The DI 5.5LCR features a pair of heavy-duty, gold-plated, spring-loaded wire terminals that have oversized holes to accept up to 10 gauge wire. 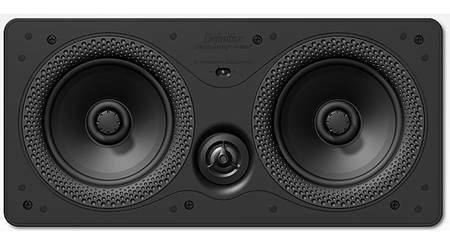 Applications: The DI 5.5LCR can be used as stereo speakers for music or as front, center, and/or surround speakers in your home theater system. Mounting: The DI 5.5LCR can be mounted in-wall using the integrated rotating clamps and six mounting screws. 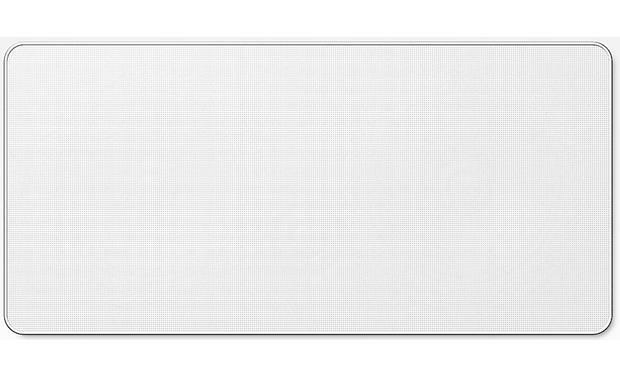 A cutout template is supplied to help you cut a 6-7/16" wide x 14-3/8" tall hole. You will need to allow at least 1/2" of space around the cutout and have at least 3-1/8" of clearance for mounting depth (using 1/2" thick mounting surface). You should allow at least 7/8" from the edge of the cutout to nearest obstruction inside the mounting surface. 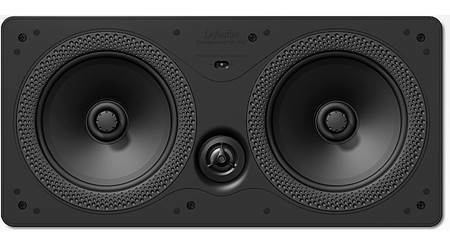 The Definitive DI 6.5LCR features two 6-1/2" woofers for bass response down to 26 Hz. 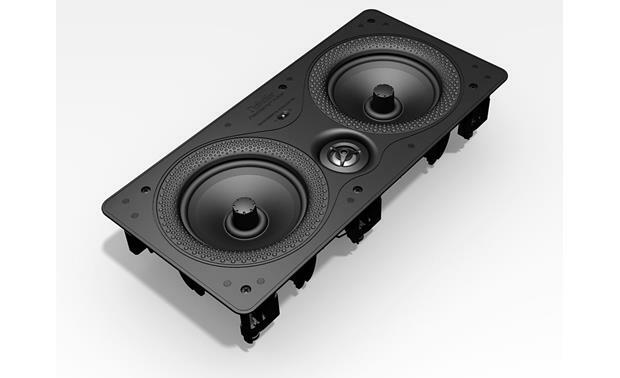 Searches related to the Definitive Technology DI 5.5LCR In-wall multi-purpose home theater speaker.